Time flies! It's been a busy, productive three months since I joined the Career Development Services (CDS) team. I wanted to take this opportunity to tell you all a little more about what (and who) CDS is and what we have to offer Peirce students and alumni. First, if you haven’t had the opportunity to meet the rest of the team, I would like to introduce them to you. 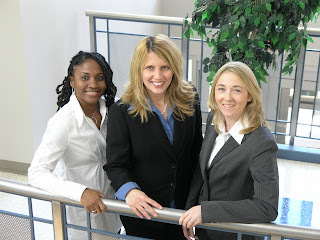 I have the privilege of working alongside two fantastic colleagues, Audrey Cooper and Robyn Dizes. Although they both provide career coaching and develop and facilitate our workshops, each woman has specific areas of expertise that can help students and alumni better prepare for new and changing careers. Audrey has been with Peirce for almost nine years. Her path has taken her progressively through many areas of the College, from the Admissions Department, to a position working with our corporate partners, then on to managing institutional partnerships and meeting with community colleges. Today, as part of the CDS team, Audrey contributes a unique perspective on where our students are coming from and great insight into what goes on behind the scenes at Peirce. Audrey’s seen it all. She’s worked with students in the thick of the admissions process and helped them graduate and launch their careers. Today, she is an instrumental part of the team. Audrey’s focus is the management of all experiential programs including work study, internships and co-op opportunities. She also manages our job board, ResumeXchange, and is the go-to person for employers and alumni. Robyn joined Peirce four years ago, also starting in Admissions before making the move to CDS, where she works as a career counselor. Robyn gets a lot of face time with Peirce students, coordinating in-person as well as online support services and programs that the CDS department offers. This means everything from resume review to job search support and interview tips. She is also largely responsible for the workshops we offer which tackle topics such as career change, networking, grad school prep, job search in a tough economy, and etiquette. Together, Audrey and Robyn work as liaisons with faculty, outside institutions, and student organizations to build strong partnerships and get the word out about career development services. As you can see, CDS covers a lot of ground. Need a resume and cover letter review? We can help. Looking for an internship or co-op program? We have the relationships with local businesses to get you the experience you need. Ready to start your career? One-on-one consultations with Peirce career counselors will hone your job search and interview skills. We’re proud of the wide range of services we offer. But that doesn’t mean we can’t do better! The team is very excited about the future of Career Development Services and is in the process of expanding our programs and refocusing our mission to make the department bigger, better, and more valuable to the student body than ever before. That’s why we want to hear from you. We’re looking for your input as we evaluate the services we offer and how we can best meet your needs, so please use the blog as a forum to share your suggestions. Tell us what you really need from us. What’s worked? What help are you looking for that we don’t offer today? We encourage you to use the comment section, or email the CDS team, to offer feedback and share ideas. In the meantime, two things will always remain the same. The core of our philosophy has always been, and will always be, centered on two things. First is engagement -- getting students to utilize the services at their fingertips and recognize that they are crucial for career success. Second is providing access -- we want students, alumni, and employers to have access to each other, and our role is to facilitate those connections. So that’s where I’ll leave you for now. Come to our offices (FYI: We’ll be moving to a new location in the fall,) call us at 888.GO.PEIRCE, ext. 9202, email us, comment on the blog, whatever works! We want to hear from you, and we want to help you navigate a successful career path.